Join this free online course to learn how to build your first mobile app with SAP Cloud Platform SDK for iOS. This sdk enables you to quickly develop your own native enterprise apps, built with Swift, Apple’s modern programming language. Along with SAP Fiori for iOS, which includes reusable design components, you can build beautiful intuitive native business apps. SAP Cloud Platform SDK for iOS enables you to quickly develop your own native enterprise apps, built with Swift, Apple’s modern programming language. Along with SAP Fiori for iOS, which includes reusable design components, you can build beautiful intuitive native apps. This course includes optional hands-on exercises, providing you with the opportunity to develop your own native mobile app. Before the official course start, we will show you how to set up your Apple computer (required to run Swift) by installing the SDK and undergoing tests to ensure you are ready to start developing your first native mobile app with SAP Fiori for iOS. To start, you will learn about the concepts and functionality of the SAP Cloud Platform SDK for iOS. You will get step by step instructions on how to create this sample shop app, starting with the installation of the SDK, retrieving of backend data, using SAP Fiori for iOS design elements and finally deploying it to your device. This course is aimed at everyone interested in developing native mobile iOS apps using this new SDK. Please note: This course is in self-paced mode. The practical system exercises are not supported anymore. The discussion forum is closed and questions cannot be answered anymore by our experts. How is an openSAP course structured? If you are interested in learning more about the SAP and Apple partnership, please enroll in the openSAP course SAP Fiori for iOS - An Introduction. And checkout www.sap.com/apple for the latest news. If you want to learn more about how to develop in the Apple environment, please have a look at these Getting Started with iOS Development Videos. Here you can learn about the essential concepts, tools, and programs used to build amazing business apps. 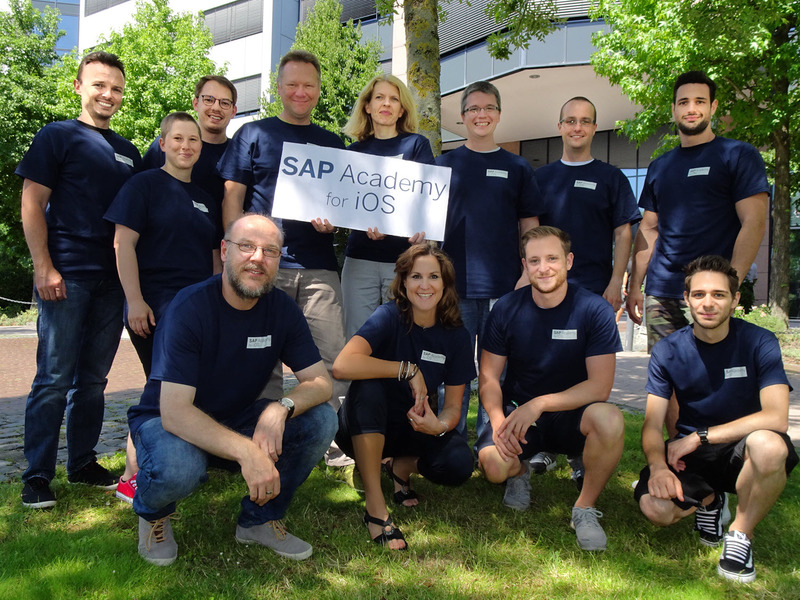 Here you see our SAP Academy for iOS team. From left to right: Florian, Denise, Markus, Torsten, Hansi, Marita, Anja, Andreas, Steven, Tobias, Kevin, Dennis. We are looking forward to meeting you in the discussion forum. Note: this course will be updated soon! If you have purchased an openSAP, course reactivation option from the SAP Store, enter the reactivation code below. Once you redeem the reactivation code, you will have 8 weeks to complete the requirements to earn a Record of Achievement. You must supply a reactivation code. Don't have a reactivation code? If you would like to purchase a reactivation code please visit the SAP Store. For pricing details and more information check the FAQ. You can access all graded assignments and earn a Record of Achievement with openSAP, course reactivation option. Learn more or reactivate now! If you would like to enroll for this course, there are no formal prerequisites or limitations. The course is free and open for everyone. Just register for an account on openSAP and go for the course! This course was held from Aug 29, 2017 through Oct 04, 2017. This course was rated with 4.54 stars in average from 582 votes. Gain a confirmation of participation by completing at least 50% of the course material. Hans-Jürgen (Hansi) Richstein is Chief Development Architect at SAP SE Global Design/Frontrunner Apps, focusing on Mobile and UX, but also covering other SAP technologies. Hansi joined SAP in 1998, after he made his first experiences in early mobile technologies at the IBM European Networking Center, Heidelberg. The topic of Mobile was always part of his life ever since, be it for several projects throughout his SAP career or privately as developer of mobile games. Andreas has 10 years experience in mobile. He was the responsible architect of SAP Mobile Platform 3.0 and with the shift towards cloud then defined the architecture of SAP Cloud Platform Mobile Services. His main focus is on service consumability and APIs. Recently, Andreas took responsibility for the SAP Cloud Platform SDK for iOS as the Chief Product Owner. In this role, his attention is on building an easy to consume, modern Swift SDK that feels natural to iOS developers and makes it easy to develop enterprise mobile applications end-to-end – from mobile app to mobile services to the backend. Dr. Marita Krümpelmann is Chief Development Architect at SAP SE Global Design. As part of the Frontrunner Apps team which is in pursuit of creating and building innovative scenarios to drive the evolution of Fiori, she particularly looks after the SAP Fiori Reference Apps devoted to best practices for SAP Fiori design and development. Marita has more than 20 years of experience in software industry and has been involved with SAP mobile development projects ever since the first iPad was launched. Anja Kutscher is a senior product expert at SAP SE, with focus on user experience and project management. After working several years for the UX development program she is now leading the SAP Academy for iOS.